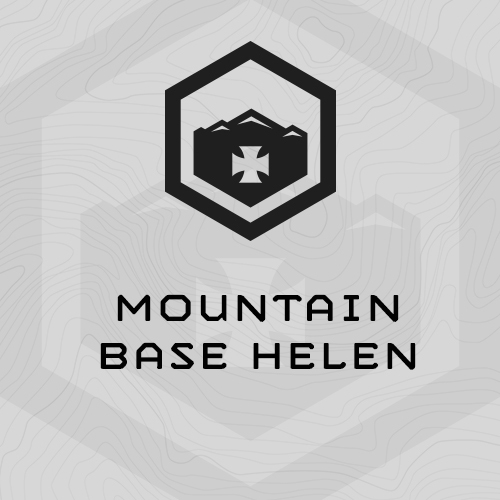 Mountain Base Helen continues to deploy our latest iteration of fluid periodization for all around mountain athletes. This 6-week, 6 day/week, 36x Session Training Cycle combines gym-based strength, speed-over-ground endurance, aerobic base training, chassis integrity, multi-modal endurance and climbing strength/work capacity in the same cycle. – Tuesday’s Speed Over Ground development begins with a 6-mile run for time assessment. Subsequent sprint repeats are based on your run completion time, as is Saturday’s long run pace. Note – if you run your assessment slower than 60 minutes (10-min miles), your long Saturday runs begin at 8 miles. If you run faster than 60 minutes, your long Saturday runs begin at 10 miles. – Monday and Wednesdays gym-based efforts have a lot going on. They begin with a heavy barbell total body strength exercise (Monday) or a heavy lower/upper body strength circuit using dumbbells (Wednesday). Following the strength work is a short, intense 3-5 minute complementary work capacity effort designed to elicit a “hormonal flush” and improve strength gains from the strength work. Both sessions finish with a hard, 20-minute Chassis Integrity grind. – 6 Days of speed over ground or endurance work this cycle – Tuesday, Thursday and Saturday. We pull back some from loaded step up work compared to the previous cycle.